Provide your cat with the ultimate outdoor climbing experience without ever leaving the safety and security of your living room. The On2Pets Luxury Cat Tree House is an innovation in modern cat furniture, the purrfect blend of utility and aesthetics. 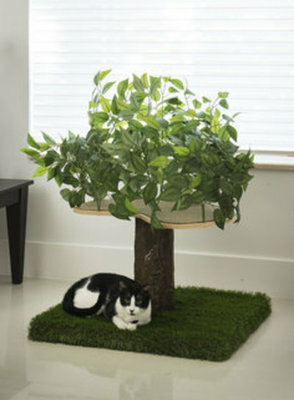 This realistic cat tree provides your cat with a paradise of its very own inside your home. A place of their own to feel safe and secure, while relaxing all they want. This Luxury Cat Tree is designed not only for your cat's comfort and entertainment, but yours as well! Each tree has sleek, curved perches and faux leaf design. The leaves provide canopy cover, which appeals to your cat's natural instincts to stay up high and undercover.